Notes: Footage from inside Buckingham Palace as Paul recieves his honour. 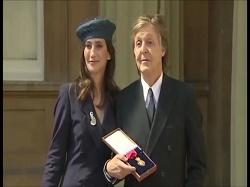 Notes: Paul outside Buckingham Palace after receiveing the honour & answering a few qusetions. Notes: Paul outside Buckingham Palace after receiveing the honour & answering a few questions.